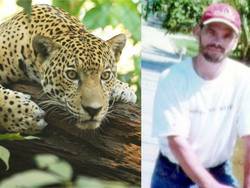 In a bizarre twist of fate, and to date the only fatality related to Hurricane Richard, was the death of American Ex-pat Bruce Cullerton when sometime on Monday a contained jaguar escaped from his hurricane damaged enclosure and lethally mauled Cullerton. The grim accident took place near the Belize Zoo on the Western Highway after the area took a direct hit from the hurricane Sunday night. Professional wildlife photographers and owners of the animal compound where the jaguar was contained, Richard and Carol Foster, reported that their property had sustained a lot of damage, and in a Facebook post on Monday evening Carol wrote, "We made it through 120mph winds. Wow!! What an experience. We were in the eye of the hurricane and when it passed it really went wild. The sound of the wind and the rain was so powerful. [...] But the worst of all is the jaguar got out - this is MAX and really beautiful young male...now it is not safe walking around the place." Ironically her fears became a reality when her neighbor, who may have been trying to rescue his dog from the jaguar attack, lost his life while doing so. Tuesday afternoon news reports were rampant about the attack and Belize Wildlife Officials, along with law enforcement, Belize Zoo personnel and local animal experts descended on the area to determine their next move. In a phone interview with Wildlife Officer Rasheda Sampson, Sampson told The SPSun that last night a team of highly trained animal experts, including the Belize Forest Department (BFD), set up a series of snare traps with sensors along the Foster and Cullerton's property. At approximately 9:30pm they successfully snared the animal within feet of its home enclosure and after positive identification the jaguar was euthanized. But how is it that this animal came to captivity in the first place? Unfortunately some exotic jungle animals are highly desired as pets and are illegally contained. In the case of Max, the animal was apparently surrendered two years ago after his illegal owners failed to care for him. In ill health the jaguar was placed at the Foster wildlife filming compound where in the past they had an understanding with the Conservation/Forestry Department to legally keep and nurture confiscated animals. For Max and other illegally contained wildlife there is no future but a life inside a cage. Once an animal like Max, who is an apex predator, is conditioned to depend on man for food their association with humans is a very dangerous one. According to Cherie Chenot-Rose, director and biologist for the American Crocodile Education Sanctuary (ACES), apex predators are those animals at the top of the food chain, including humans. They play a key role in keeping our ecosystems in balance. When untrained persons attempt to domesticate any apex predator it normally ends in a tragedy. Apex predators fed by humans learn to associate people with food, and will seek people out for an easy meal. "It is very unfortunate that people still insist in breaking the Belize Wildlife Protection Act and try to keep wild animals as "pets." The law is there to protect people and the animals themselves. In this incident the jaguar was originally illegally kept and was ill. The animal was confiscated and put into the hands of a professional caretaker. If the animal had never been taken from the wild illegally as a pet to begin with, this cat would not have been in captivity. Once an apex predator no longer sees humans as a threat, they become very dangerous animals. A wild jaguar will normally run and hide to avoid encounters with humans. In fact, it is a rare and beautiful thing to catch a glimpse of a jaguar in the wild. This incident should by no means be reflected as a typical behavior of jaguars and we are praying for all those involved," stated Chenot-Rose. In this tragedy there is a lesson to be learned. Colette Kase, founder of Be Kind Belize stated, "I was extremely saddened to hear about the tragic death of Bruce Fullerton and send my deepest condolences to his family and friends. The objective of Be Kind Belize is to promote kindness and compassion towards all living creatures and I believe that this is best done through education and understanding of ourselves and our relationship with other species and the environment. The native species of Belize are magnificent and valuable treasures and they need our protection. The jaguar involved in this terrible accident had been kept and fed by humans and so had no fear of people. When wild predators associate humans with food, they lose their natural fear and have the potential to become a serious threat to human life as we've so sadly seen happen here. This was a very rare incident and I urge parents and educators to take this opportunity to pass on the message that Belizean wildlife is to be respected and revered from a distance and explain to children that it is dangerous to the future of the Belizean environment and to our community to feed, harass or interfere with wildlife in any way. Let's extend our love and compassion to those who are grieving and try to learn an important lesson from this sad event." According to Wildlife Officer Rasheda Sampson the Belize Forest Department Wildlife is in the process of drafting new wildlife legislation. Current statutes need updated and some existing laws are antiquated and vague. Consultants for the new legislation included the Belize Wildlife Conservation Network which is a network for Wildlife conservation entities in Belize. Hopes are that with more comprehensive laws in place the public will gain a better understanding of wildlife laws while accomplishing more effective enforcement. The draft proposals also outline extensive regulations for wildlife containment.